Chocolate Loving - Thank you Cherrapeno! Thanks to Cherrapeno for the greatest choc cake recipe I have ever made. Nigella's recipe uses a food processor to blitz all the ingredients together, I used a hand-held electric mixer instead. I also melted the chocolate for the main part of the cake. You will need a large loaf tin, mine was 23cm x 14cm, 7cm deep and Nigella uses one that measures 21cm x 11cm and 7.5cm deep. Line the cake tin with non-stick baking parchment and preheat the oven to 170ºC. Melt the chocolate for the cake in a glass bowl either in a microwave or set over a pan of simmering water. Put the flour, bicarbonate of soda, cocoa, sugar, butter, eggs, vanilla and sour cream into a large bowl and using an electric hand whisk, start whisking the mixture together. Add the melted chocolate and gradually add the boiling water. Whisk until you have a lovely glossy mixture. Pour the mixture into the prepared loaf tin and pop it into the oven. Bake for about an hour, it may need more or less time. Check with a metal skewer, insert it into the cake and if it comes out clean it's ready. While the cake is cooking, put the syrup ingredients into a small saucepan and bring to the boil. Boil for about 5 minutes, you want a reduced liquid, more of a caramelized syrup. When the cake has cooked, remove it from the tin, keeping the paper on and put it onto a cooling rack. Make some holes in the top of the cake and pour the syrup as evenly as possible over the cake, trying to get it to run into the holes. When the cake has completely cooled, you can remove the paper and put it onto a serving plate. 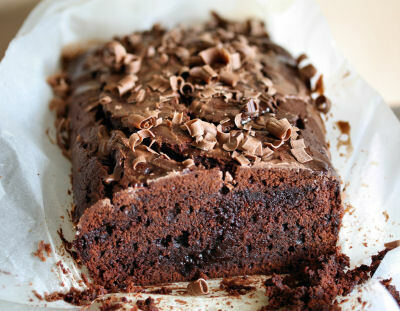 Slice the small bar of chocolate into slivers and scatter it over the top of the cake before serving.